Hair: Grey with a dark stripe after exposure to radiation, originally Brown. Other distinguishing features: Green skin when using his powers. Story: Solar was working on an energy-into-matter project in Atom Valley, when there was a leak in the nuclear reactor at the lab. This was an attempt to get rid of either Solar or his co-worker Bentley to make room for Nuro's agent Rasp. Bentley, who was working at the reactor that evening, discovered the leak and started fixing the problem. He was still working on the reactor when Solar came to the reactor to help Bentley in his research. Together they succeeded in shutting down the reactor, but at the same time they both absorbed deadly doses of radiation. The radiation killed Bentley while Solar became a radioactive powerhouse. In a sense Solar died along with Bentley, as he did not have any heartbeat or metabolism . Before the accident, Solar and Gail Sanders were dating but after the accident Solar was forced to avoid human contact. Originally only Clarkson, the head of security at the lab and the president knew about Solar's powers, but when Solar's hair changed color, he was forced to explain his isolation to Gail . In the beginning Solar didn't go public with his powers but worked in the background. After a while he realized that might be exposed at some point, he therefore designed a suit, which would hide his identity while he was out on missions . Skills & abilities: Super-strength and flight. 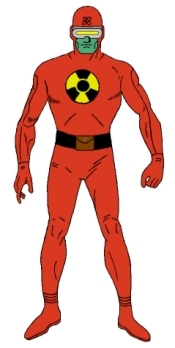 Equipment: Solar wears a suit to contain the radiation he gives off. In his belt pouch he has pills with radioactive material for replenishing his strength. Erica Pierce/Mothergod: The woman behind Unity (Valiant). Similar powers. Jan Arrah/Element Lad: Legionnaire from the pre-crisis version of the Legion of Super-Heroes. Transmutation of elements. Jonathan Osterman/Dr. Manhattan: Scientist and adventurer from DC Comics series Watchmen. Similar powers. Phil Seleski/Solar: The Man of the Atom from Valiant. Similar powers.